Born into a musical family, Jerry started listening to Jazz at an early age. His father, Joseph Costanzo, began his music education early and taught him to play saxophone when he was in the third grade. Jerry's parents played the radio every morning and weekend he and the family would all try out their crooning abilities to the songs of Frank Sinatra, Jerry Vale, Perry Como, Nat Cole and others. Jerry learned all the classic standards through "osmosis." After high school, Jerry studied acting at the Herbert Berghoff studio in NYC. One of his teachers was William Hickey (You may remember him; he went on to be nominated for best supporting actor in the film Prizzi's Honor). While he attended acting school, Jerry landed a job working for Al Pacino as his personal aid and chauffeur, where he got to rub elbows with a lot of famous people. Around 1980, Jerry's father started a Big Band called The Memories Of Swing. Around 1985, Jerry started subbing on alto with the band. "I wouldn't say I was ever a very good sax player but I got by" says Jerry. Up until then, he had been playing with the horn section in a classic rock band and did some singing. That all changed the day his father asked him if he would like to sing with the big band. Jerry was never truly happy playing rock or Pop. "My heart was always in Jazz & Big Band Swing". Jerry is now a full-time vocalist & bandleader. He has recently released his first CD entitled "Destination Moon" and formed his own label Semi-Quaver Jazz. 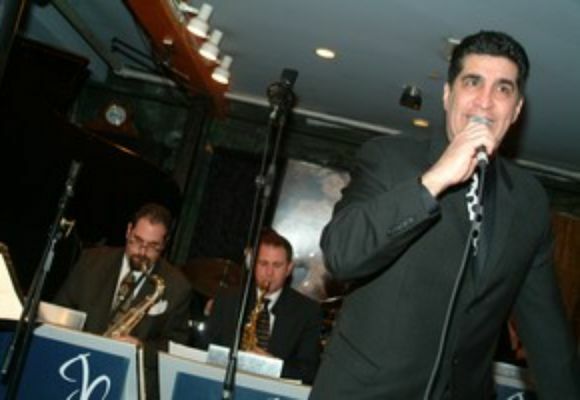 Jerry leads his own big band - The Jerry Costanzo Orchestra, directed by Mike Carubia, and is working with saxophonist, arranger and producer Mr. Andy Farber & his Swing Mavens octet, as well as his smaller ensembles; Trios, Quartets, and Quintets. Jerry has also been very fortunate to be working with many of the best jazz musicians on the scene today, and continues to work with such names as Steve Ash, Ted Firth, Tardo Hammer, Neal Miner, Joe Cohn, Dave Glasser, Mike LeDonne, Jerry Weldon, Mark Sherman, Ben Wolfe, Jimmy Madison, Alvestor Garnett, Hilary Kole, Amy London, and others.